Hillary Clinton did not comply with State Department policies on records in her use of private email. 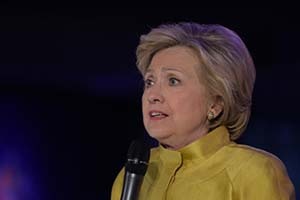 The report, obtained by The Associated Press this morning, said Clinton circumvented the policies in place that ensure adherence to federal records law. If this is the conclusion Clinton's "pals" at the State Department have reached, we are forced to speculate it's very possible the FBI will recommend an indictment once it has concluded its investigation. "At a minimum, Secretary Clinton should have surrendered all emails dealing with Department business before leaving government service and, because she did not do so, she did not comply with the Department's policies that were implemented in accordance with the Federal Records Act." The report goes on to say that Clinton produced 55,000 pages of emails to mitigate her failure to preserve the emails, but the State Department Inspector General "notes that Secretary Clinton's production [of 55,000 pages of emails] was incomplete." For instance, of the 55,000 pages Clinton emails handed over, there were no sent or received correspondences from the first few months of her tenure as secretary. The independent audit also chastised the State Department and its secretaries for being "slow to recognize and to manage effectively the legal requirements and cybersecurity risks associated with electronic data communications, particularly as those risks pertain to its most senior leadership." She's a corrupt as they come. It's a pity she has this situation now though, because if she's elected president, and get's indicted after the election, it'll just be a very big headache for everyone.